Microsoft Azure is the PUP that uses misleading techniques to prevent removal. Use Reimage to locate malicious components and get rid of them faster than with uninstall instructions. A full system scan blocks virus reappearance and prevents traffic to malicious domains. Microsoft Azure notification is another technical support scam that pretends to be a notification from the legitimate Microsoft services. However, if you received a pop-up warning about detected “suspicious incoming network connections” and asking to call +1888-790-4177, be aware that it is not legitimate and most likely caused by adware that resides on your PC. 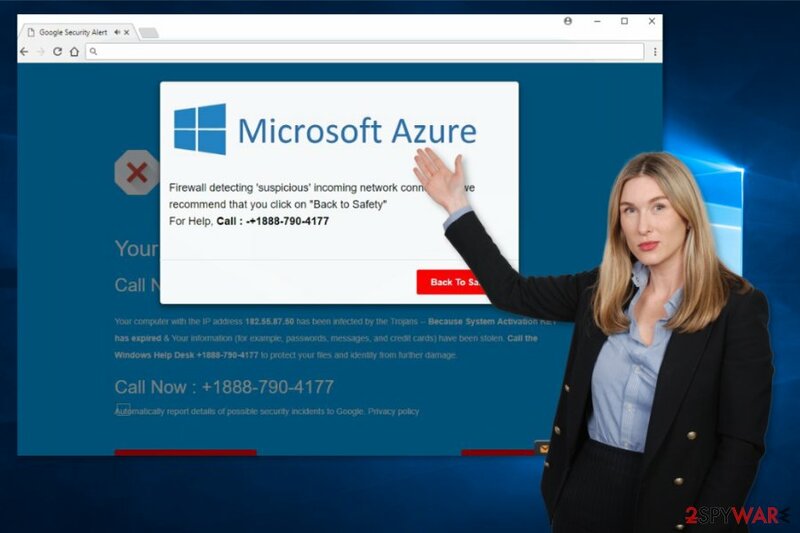 Redirects to “Microsoft Azure” scam website is often triggered by a potentially unwanted program (PUP) that usually spreads attached to various freeware. Thus, it may have infiltrated the system unnoticed. Immediately it may have altered Windows registry and browsers’ settings to force you visiting a misleading website. All the mistakes should warn that something is wrong with Microsoft Azure pop-up. However, clicking “Back To Safety” button is not recommended because you might install spyware or malware. As we already mentioned, calling the number is not needed as well. If Microsoft Azure virus continues bothering you, you should check computer’s security and look up for adware on your computer. It may have arrived in the form of program or browser add-on. Thus, you need to investigate the system in order to stop unwanted redirects and ads. At the end of the article, we have provided detailed and illustrated Microsoft Azure removal guide. If you decide to opt for this quite challenging elimination method, please follow the instructions in order not to overlook adware-related components. Otherwise, scammers continue trying to reach you and trick you into downloading or purchasing useless software that is supposed to clean your PC. Additionally, they might be willing to convince you installing remote access tools to get full access to your computer and cause lots of problems. However, if you want to remove Microsoft Azure adware without moving so much effort, you should get the anti-malware software and run a full system scan. A program like Reimage can easily detect and terminate this potentially unwanted program. 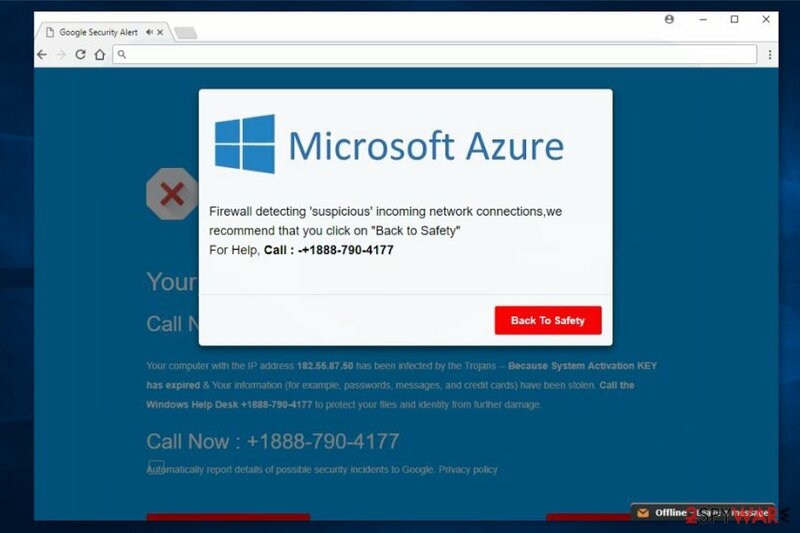 Microsoft Azure scam wants to trick users that their computers were infected and they need to call fake tech support line. Adware program which is responsible for Microsoft Azure scam might be included in any freeware or shareware package. The hijack might occur when users use Quick/Standard installation setup instead of Advanced/Custom. The main difference between these two settings is that Quick installation does not reveal about third-party programs. Meanwhile, Advanced settings not only shows the list of “optional downloads” but allows rejecting their installation as well. Thus, you should always use them. To stop redirects to scam website, you have to find and remove Microsoft Azure adware together with all its components. At the end of the article, you can see illustrated guide how to complete this task manually. 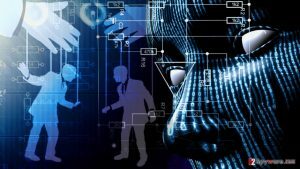 However, security experts from virusi.hr warn that manual virus elimination might end up with failure if you rush and leave some adware-related components on the system. Thus, it’s better to opt for automatic Microsoft Azure removal option to clean your PC. The guide below will explain to you how to remove Microsoft Azure adware from Windows OS. Then check each of the browsers installed on your PC and eliminate suspicious entries from them. Here, look for Microsoft Azure or any other recently installed suspicious programs. Wait until you see Applications folder and look for Microsoft Azure or any other suspicious programs on it. Now right click on every of such entries and select Move to Trash. Interet Explorer reset helps to speed adware elimination procedure. When in the new window, check Delete personal settings and select Reset again to complete Microsoft Azure removal. Once these steps are finished, Microsoft Azure should be removed from your Microsoft Edge browser. Uninstall questionable add-on that might responsible for Microsoft Azure ads. You should reset Firefox too. Here, select Microsoft Azure and other questionable plugins. Click Remove to delete these entries. Now you will see Reset Firefox to its default state message with Reset Firefox button. Click this button for several times and complete Microsoft Azure removal. Microsoft Azure removal requires uninstalling suspicious extensions and resetting Google Chrome. Here, select Microsoft Azure and other malicious plugins and select trash icon to delete these entries. Click Reset to confirm this action and complete Microsoft Azure removal. Here, select Extensions and look for Microsoft Azure or other suspicious entries. Click on the Uninstall button to get rid each of them. Now you will see a detailed dialog window filled with reset options. All of those options are usually checked, but you can specify which of them you want to reset. Click the Reset button to complete Microsoft Azure removal process. 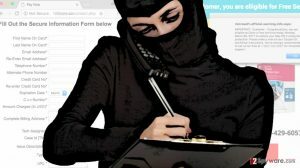 ^ Everything You Need to Know About the Microsoft Support Scam. BBB. The official website of Better Business Bureau . ^ Olivia Morelli. How to remove adware viruses. No Virus. British cyber security news and malware database. ^ Virusi. Virusi. Latest cyber security news from Croatia. This entry was posted on 2017-12-15 at 04:09 and is filed under Adware, Viruses. You can quickly scan the QR code with your mobile device and have Microsoft Azure ads manual removal instructions right in your pocket. How did you remove Microsoft Azure ads?